Well, well, well. Today one of Betsy’s students, an absolutely brilliant girl named Scarlett, gave me a gift I can truly appreciate. 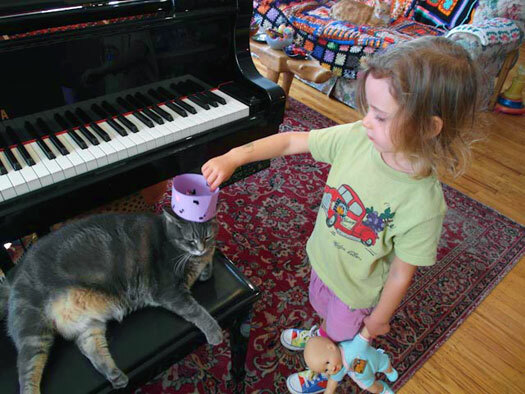 She presented me with my very own, handcrafted royal crown – complete with musical notes. It’s about time someone recognized me for who I really am in spite of my humble beginnings on the streets of Camden, New Jersey. At last I will be seen as the fine aristo-cat I was always meant to be. Yes! the lovely Nora is a true diva and a true queen! I hope that she will live a very long and healthy life, she looks very healthy! There is no doubt in my mind that she was a concert pianist in a former life, to me this is so obvious. Long may she Reign!